Check below for the answers provided by county attorney candidates in New Hampshire to questions posed by ACLU-NH. Pop quiz. Who is the most powerful person in the criminal justice system? No, it’s not a judge. It’s your local county attorney. 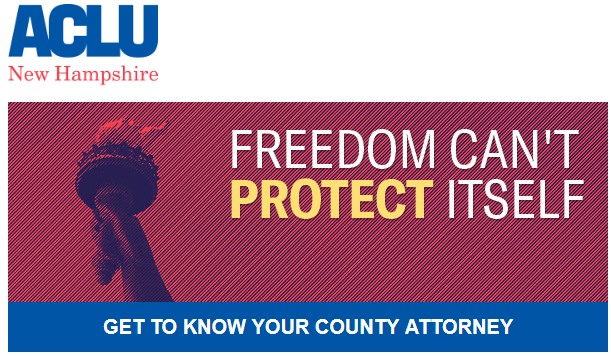 What makes your county attorney so powerful? As government prosecutors, they decide in criminal cases who is charged, the severity of those charges, or if any charges are filed. Put simply, they determine how most criminal cases are resolved. Second question in this pop quiz, how do county attorneys get to be county attorneys? Answer: they are popularly elected just like state representatives and senators. And yet, they are often one of the least understood elected positions and least known by voters. This needs to change. County attorneys’ views on criminal justice policy set the tone for how our communities respond to societal issues and have great influence on the police and Legislature. As elected officials, county attorneys need to be held accountable like any other elected official, and that begins by educating more voters about the importance of these positions across the state. It’s the county attorney who has the most say in whether someone goes to prison and for how long. Prosecutors have the power to flood jails and prisons, but they also have the discretion to do the opposite. They have the power to champion and enact criminal justice reform. County attorneys have the power to insist that people are treated fairly in everything from charging, to trial, to sentencing – regardless of race, disability, gender identity, sexual orientation or other factors. The United States has the highest incarceration rate in the world. County attorneys can help fix that with fair charging and sentencing, and by championing alternatives to prison like diversion and treatment programs. As elected officials, county attorneys are accountable to us. They have an obligation to increase transparency by meeting with community members and publicly sharing information about their policy views and how their office operates. We encourage you to engage your candidate or candidates for county attorney on the criminal justice reform issues most important to you. For starters, check out your candidate or candidates’ responses to our questionnaire below. Do you agree that prosecutors’ practices have contributed significantly to mass incarceration? If so, how? Will you commit to implementing practices aimed at reducing the jail and prison populations during your two-year term? If so, please identify your goal and what specific combination of reforms you anticipate will help realize this goal. Will you commit to promoting the use of diversion and/or treatment programs as alternatives to incarceration for drug offenders and defendants with mental health issues? Will you commit to developing and implementing a plan to personally, regularly, and meaningfully engage and communicate with all constituencies in your county in the first 100 days of your term (especially communities of color, immigrant communities, community-based organizations, and criminal justice reform advocates), and to involve them in determining the priorities for your office?